Do you know a young person who puts the needs of others before themselves? Or has overcome hardship but still perseveres to make a difference in their community? If so, they would be a great candidate to be honored as a 2019 Pamplin Media Group Amazing Kid. The deadline for submission is 11:59 p.m. Monday, March. 4. Each Amazing Kid's story is shared in a special section distributed through the Pamplin Media Group's 20 newspapers and read by more than 400,000 readers throughout Oregon. All the youths will be honored at a gala event in May hosted by the Pamplin Media Group and featuring a celebrity keynote speaker. — A senior at North Marion High School who used art to make a power statement about bullying. — A 16-year-old inventor in West Linn who designed a device to help infants sleep safer. — A fifth-grader from Central Oregon who collected 7,000 articles of clothing for the needy. — A Portland High School student working to ease tensions between police and African-American youth. — A teen from Gladstone who helped expand athletic opportunities for students of all abilities. Newspaper staff from each Pamplin Media Group newspaper will select an Amazing Kid from their respective coverage area. 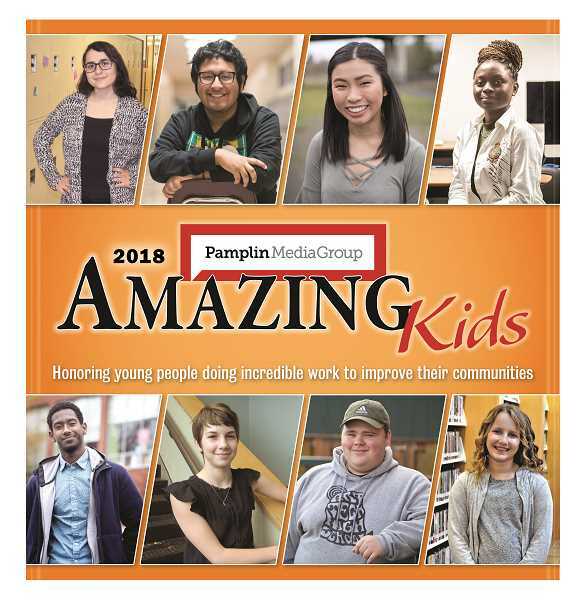 In choosing each Amazing Kid honoree, the Pamplin Media Group newspapers place a heavy emphasis on volunteerism that makes a difference in the lives of other people. If you know of an exceptional young person, please submit a brief description of why your nominee deserves to be recognized, along with location and contact information for both the nominator and the nominee. Nominees can be a high school senior or younger and there is no school affiliation requirement (homeschool, charter school, etc., is OK).